Cruz swept delegates in Wyoming after doing so last weekend in Colorado. Donald Trump's convention manager feels confident Trump can reach the 1,237 delegates needed for the Republican presidential nomination despite Texas Sen. Ted Cruz sweeping up 14 more delegates in Wyoming Saturday, yet another victory at a state convention where a disorganized Trump campaign was boxed out. Paul Manafort told George Stephanopoulos on ABC’s “This Week” Sunday that the Trump campaign “didn’t want to waste” its money in Wyoming, where it failed to provide a full slate of preferred delegates, only naming six of the possible 14. Manafort maintained that despite another loss, Trump would have enough support to win the nomination before the convention. "The real issue is there's not going to be a second ballot" at the convention, he said. "There is [sic] many paths to 1,237 for Donald Trump between now and the middle of June -- not July -- and we are working all of those paths." Cruz’s delegate operations director, Ken Cuccinelli, countered that Trump’s campaign was whining in a later interview on the show. (Splash News | AP Photo) Paul Manafort is seen in Midtown, April 11, 2016, in New York City. | Ken Cuccinelli testifies on Capitol Hill in Washington, Jan. 20, 2016. Trump has recently criticized the Republican National Committee for its process of choosing delegates, repeatedly calling the system “rigged” and forecasting a “rough July” at the convention is held if the process wasn’t changed. Manafort echoed the sentiment. Both the Cruz campaign and the Republican National Committee at large have countered those claims, saying the rules for each state have been clearly laid out and explained to the campaigns. 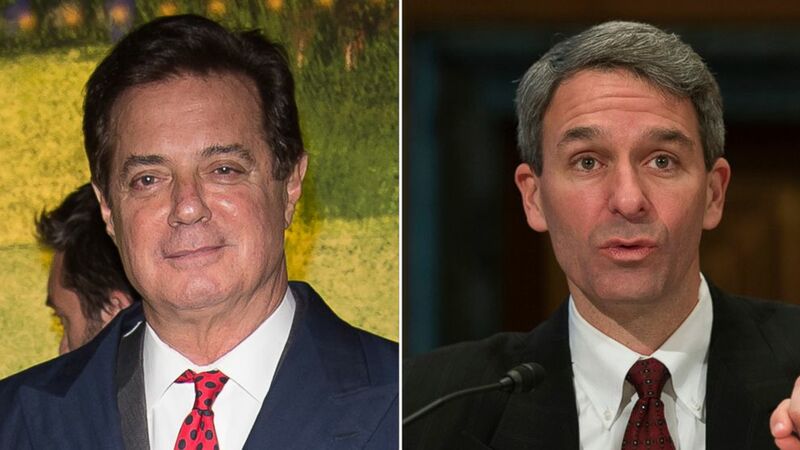 “We’ve been winning states, we’ve been winning delegate contests, we’ve been winning elections and when we win, Trump whines and you heard more of it from Mr. Manafort there this morning.” Cuccinelli said. Trump’s campaign has accused the Cruz campaign of breaking the rules when it comes to the hunt for the delegates needed to secure the nomination. Manafort threatened that the campaign would be challenging some results. “We’ll be filing protests. Missouri, we're going to be filing protests. Colorado, we're going to be filing protests,” Manafort said. “We’re playing within the rules established a long time ago and motivating voters based on Ted’s vision,” said Cuccinelli, who, in turn, accused Trump’s campaign of using unsavory tactics to win delegates. Trump currently leads Cruz by 197 delegates, and polls show a majority of Republican voters believe that whoever has the most votes and delegates should win the nomination. But Cuccinelli pointed back at rules set by the Republican National Committee that require a nominee to have won a majority of the delegates.